Whether you’re seeking to maintain your health or improve it, it makes sense to turn to a workout buddy to help motivate you. Research demonstrates that you’re more likely to stay on track when you have a workout partner. 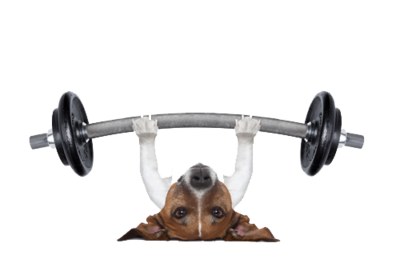 Since your pets have important exercise requirements to keep them healthy, why not take care of all those needs at once? Read on to find out what activities you can do with your pets to create a mutually-beneficial routine, as well as what you can gain from such a routine. Walking, jogging, and running are among the most common activities you could perform with your pets. When you go on a quicker walk or a run with your dog, you can get yours and your pets heart rate up and build endurance. Depending on your pet, you can even do some slower cycling, or go swimming. If you live near a body of water that’s safe to swim in, don’t let your pet have all the fun without you! Bring your swimsuit and join your pet with a some classic doggy paddle. Part of what’s so rewarding about all of these activities is the element of exploration. You can take new paths on a local hiking trail, go to new parks, or even just see corners of your neighborhood that you’ve never visited. While you take in that beauty visually, your four-legged friend will appreciate the new smells along the way. Depending on the size of your pet, you may find vigorous playtime will tucker them out before you’ve even broken a sweat. Maybe the idea of going on a run with said furry friend is just ridiculous. You can still build in a challenge for yourself and turn playtime into a type of strength building routine. While you’re tossing toys, perform squats or wall sits. If you get on the floor when you play with your pets, take advantage of your position and plank. You could also do crunches and make it a part of fetch. Throw a ball for your pup when you crunch up and then see how many more you can get in before the toy has been retrieved and brought back to you. Regardless of the specific routine you choose, you will get the benefit of connecting emotionally with your pet and the release of endorphins from your exercise. Basically, you’ll have a happy-hormone cocktail, which is particularly important if you’re burdened by stress. If you have any doubts or concerns about starting an exercise routine, consult your doctor. If the concern is about your pet, definitely consult your veterinarian. Remember, if either of you has been inactive recently, you’ll need to ease into exercise and allocate time for recovery. Finally, make sure you both stay hydrated throughout your workouts. Now, get out there and get active!